A few years ago, I wrote about how American Library Association Graphics makes it easy for members to create their own, mini READ Posters. You simply download your photo (or anyone's photo), select one of four READ backgrounds, then add text if you wish. The end of a school year or beginning of summer vacation is a good time to remind librarians and friends of this cool tool. How could you use it? Invite all teachers, students, and staff to get their own very special mini-READ poster? I'm sure students of all ages will come up with lots of creative ideas. I didn't know there was an online version of the Read Posters. 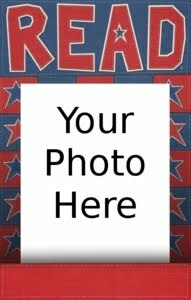 I'd love to use photos of teachers and create a page on my webpage with photos of the teacher and their favorite books, most recent read, etc. How fun!